Remember going to parties when you were a kid? You got excited for games of Twister and Pin The Tail On The Donkey. And if there was cake then that was the icing on the, uh, cake. (That pun played out better in my head.) Parties these days are all about DJing on your iPad and playing dance competition video games. Welcome to the digital age, my friends. 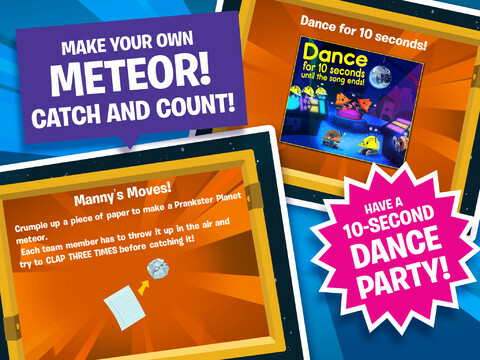 So as not to fall behind the times, PBS has recently released The Electric Company Party Game: Lost On Prankster Planet. It might sound like a long name, but lemme tell ya, this game is long on fun learning. Essentially it’s a digital board game where much of the playing and problem solving is done away from the iPad and with your fellow players. 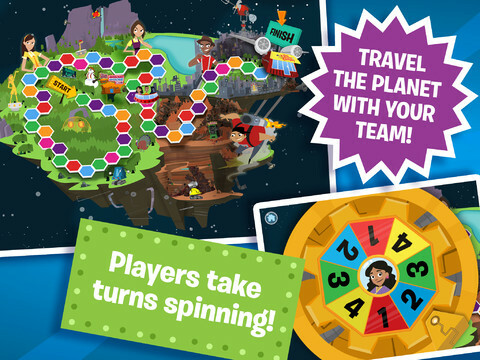 Find a friend – or 6 – and gather ’round the iPad to travel across Prankster Planet, solving riddles and using math skills to make the way to a spaceship that will bring Marcus and Jessica home. The questions that need to be answered correctly to move forward cover topics such as statistics, geometry, and time-telling. Educational goals being addressed in the game are designed to parallel 1st- and 2nd-grade skill levels. 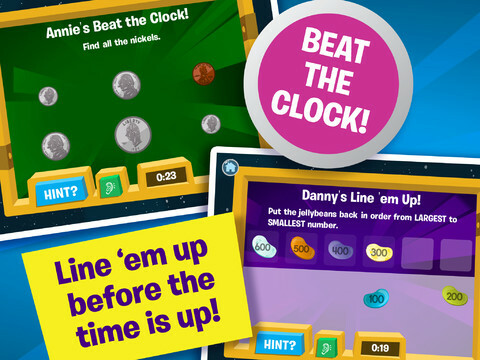 My kids (2 and 5) quickly realized that they are too young to comprehend some of the concepts in this game, despite my oldest having played the online Electric Company games on PBSkids.org. After playing a bit I did see that he was a bit young but in the next year or two would easily be able to play independently. The eponymous TV series on PBS is high-energy and fast paced, and this game is no different. It’s perfect for the 5-9 crowd who knows just enough to be dangerous but still have the attention span of a cricket. I particularly enjoyed the idea that a lot of the questions involved participation from the other players. For example, I was asked to take a survey of the other players’ favorite colors. Another question prompted me to confer with my team members on the probability of picking a red marble from a jar containing only blue and green marbles. To shake things up a bit, the game even demanded we take a 10-second dance party, which goes back to my point about cricket-length attention spans. This app is totally free – no in-app purchases or “freemium” perks. These features are something that can be found in a lot of PBS apps and give kids a level playing ground when it comes to educational apps. Having up to 7 players also means that the game is perfect for a classroom setting at a school that utilizes iPads for education. PBS has a long history of making quality, educational television programming for kids and has proven time and again that this philosophy is inherent in their digital products. These party animals definitely get an All Star rating from us!